We first met Adriana from Letters and Such when she collaborated on our Los Portales Wedding photo shoot. Adriana is full of energy for life and is on a journey to fill the world (and blank Starbucks cups) with custom hand drawn calligraphy. She described her style of lettering as modern as compared to the traditional, more formal script you may be thinking of when you hear the word calligraphy. Her art is fresh and feminine and compliments a myriad of wedding themes. 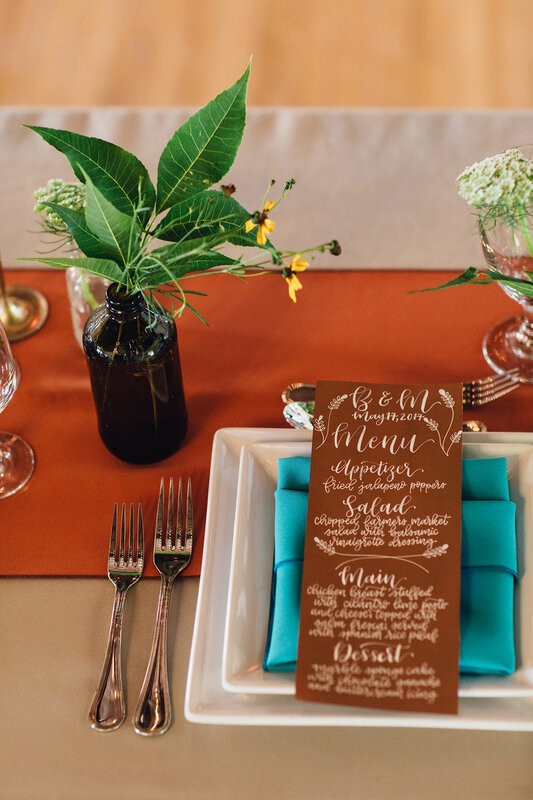 Nate and I sat down with her to discuss all the details of wedding calligraphy. Here’s an introduction video to Adriana and how she became a calligrapher. 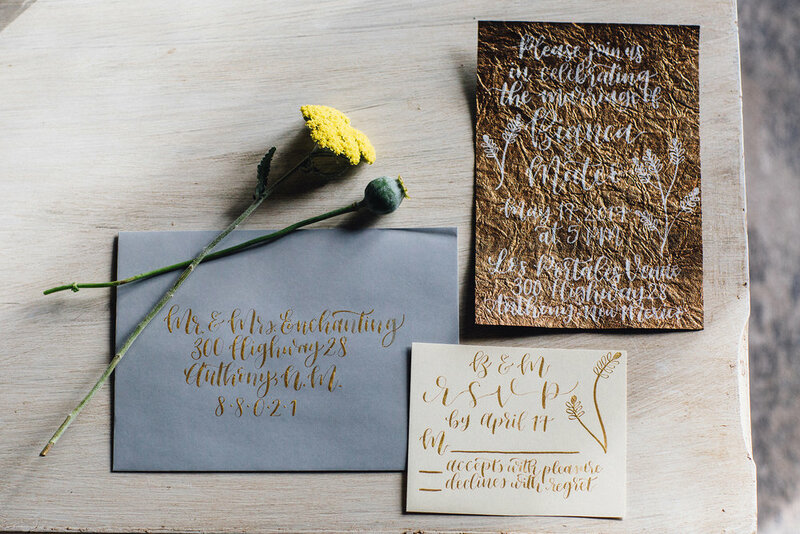 What are some ways brides can incorporate calligraphy into their wedding details? "I think the most common thing is signs, which is a huge trend right now. Welcome signs, menu boards, seating charts, dessert table signs. I also can do envelope addressing. Addressing envelopes with hand lettering and calligraphy is a really fun detail you can put on the outside of the envelope to reflect how beautiful it is on the inside. If you are writing your own vows you can have them calligraphed and lettered on special paper with colors and ink to match your wedding theme. Then your vows can be a keepsake forever and you can keep them in a scrapbook or photo album. You can customize anything!" What are the advantages of working with a local calligrapher instead of finding something online from a site like Etsy? "Of course you can find anything online. The advantage of going local is you can sit down and talk with me and I can show you actual examples of my work and what I do. You can show me examples of what you like. I am right here so I can also deliver and come on site to your venue if necessary. There’s also the benefit of supporting local business which I think is a good thing. You could go online and search to have a sign or envelopes made but there is the complication factor of waiting for your envelopes or sign to arrive and then having to ship them to your calligrapher and again wait for them to come back to you when the project is finished. Some people rent signs and cannot ship them to a calligrapher." "The thing about calligraphy and lettering for weddings is that it is custom. It is for you. You can’t go to Hobby Lobby or Wal Mart and find a sign with your names on it or your favorite saying or quote. It won’t be exactly what you want and you should have exactly what you want for your wedding." What advice can you give Las Cruces brides? "If you want a sign or something personalized, don’t do it yourself, go to a professional. A wedding is special and once in a lifetime. You are going to cherish these memories and your wedding photos forever so you want it to look really nice. It is worth it to have it done by a pro. Weddings and wedding planning can get really stressful but it doesn’t have to be." Thank you Adriana for chatting with Nate and I about all you do! You can see more of Adriana's beautiful work on Facebook and Instagram.